I am flattered to be in the company of three such successful authors whose books were also reviewed. The Community Library is a treasure in Big Canoe, thanks to the people who donate their time and the community who donates books. I also had an interview published in the Pickens Progress Wednesday edition, 5/23, which will be posted under my “Media” tab. My next book signing will be at Jasper Drugs and Gifts on the corner of Main St. and Church St. in downtown Jasper, GA. I will be there on Saturday, June 2, from 10:00 a.m. to 2:00 p.m. and look forward to meeting new friends and neighbors. Jasper Drugs is a great place to shop and and has a marvelous adjoining gift store. I feel strongly about supporting local businesses including hair salons, restaurants, and bookstores. But that may be another blog. Had a wonderful time at “First Friday” on May 4th in beautiful Fairhope, Alabama. Included as part of an author’s roundup, I joined several others to do a book signing for the Page and Palette Book Store. 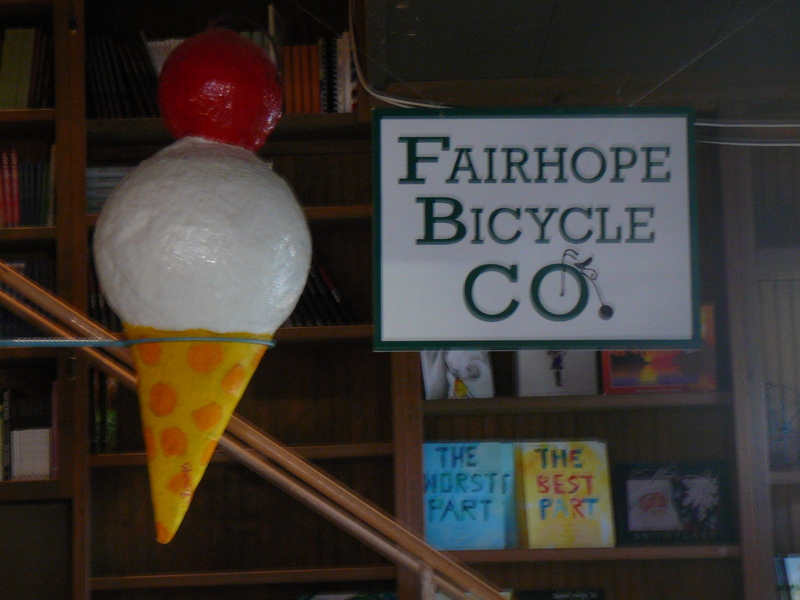 If you are lucky enough to visit Fairhope you need to check out this book store. They host frequent community events and are a must stop for many best-selling authors such John Sanford (a personal favorite of mine) who will be talking about his new book on May 22. While I sat at my table trying to look friendly, my husband browsed the streets of Fairhope which were packed with families, grandparents, and packs of teenage girls. Not sure where all the boys were. The Page and Palette had a steady stream of people who browsed, purchased books, and stopped for ice cream on the way out. Wine, cheese, snacks, and dessert bars were scattered about the section of the store that usually serves as a coffee shop. There is also a cool bicycle shop upstairs. In fact, according to my hubby, there was plenty of free food all over town, along with street musicians and arts and crafts. I can’t wait for the next First Friday so I can walk around. I did enjoy talking to the other authors. Everyone had an interesting story about why they wrote. 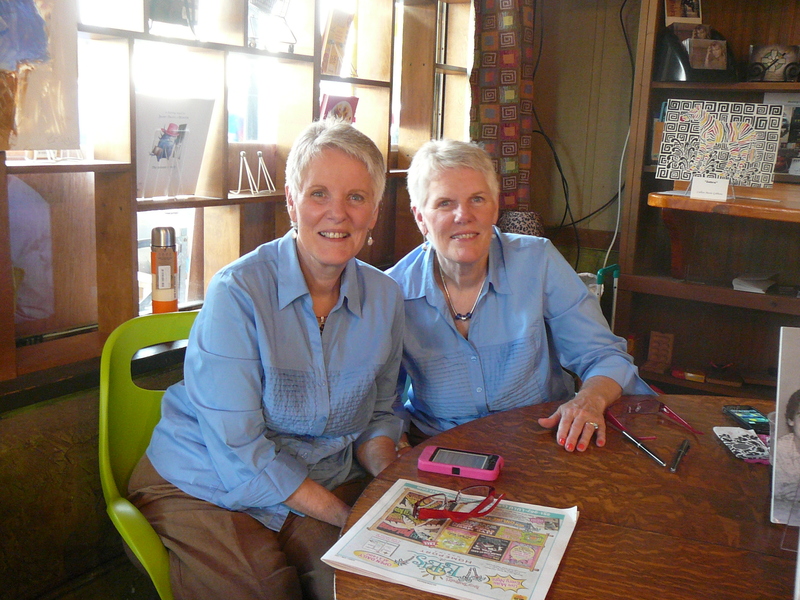 At the table next to me were identical twins, Katherine and Margaret King, who were selling their book titled: “Y’all Twins?” Their stories begin at age six when they hopped a ride on the back of a wagon driven by, unbeknownst to them, a famous member of the community, William Faulkner. I just had to read those stories and look forward to visiting their home town of Oxford Mississippi. Anyone who would like a funny and nostalgic trip back to the fifties, will love the book. I believe their next one will be called “Which is Which?” They were kind enough to let me snap a photo so you can see what I am talking about. The interview will be repeated throughout the day. I am also putting together a tour of the Southeast where much of The Messenger took place so keep posted. 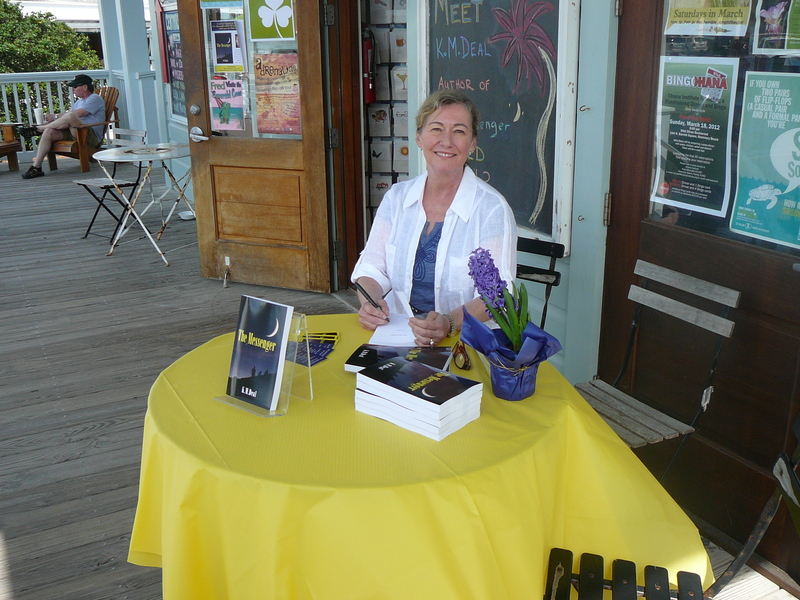 I had a book signing at Seaside on March 14th at Sundog bookstore located in Santa Rosa Beach on the Emerald Coast of Florida. Selling books was icing on the cake since just being there was a treat. Made famous by the film, The Truman Show, in 1998, the town is unique. Duplicate communities have sprouted up but nothing is quite like the original with its taffy-colored houses trimmed in white gingerbread. The day started out gray with fog rolling in off the water. But by midday, the warren of angular peaks and widows’ walks shimmered against a robin egg blue sky. Spring break was in full swing and I had a bird’s eye view from my little table on the bookstore’s front porch. The expanse of green grass on the square that supports farmers’ markets and festivals was teeming. Dogs chased balls, teenagers basked in the sun, and children toddled and tumbled along the hills. 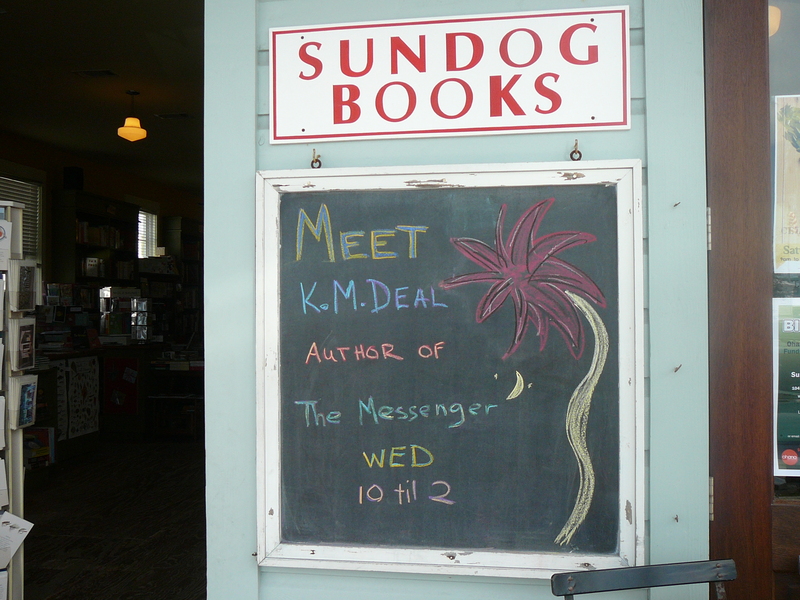 I enjoyed visiting with fellow book lovers who gravitated to Sundog which is located in the heart of the town. A lovely young girl congratulated me on The Messenger and introduced herself with a wide smile made adorable by a mouthful of metal braces. Told me she had read at least half of the books in the teen section. Two lovely ladies from Canada who had known each other since grammar school chatted with me and swapped stories about our travels. Another couple purchased a book for their daughter who was named Cozette after Le Miserable—one of my favorite novels and musicals. A man sat down next to me for a brief respite while we discussed the inspiration for The Messenger and his son’s voracious appetite for books. It was his eleventh birthday and the trip was a bonding experience for both. I discussed the challenges of being published and promoting a book with a musician who was writing his own songs and hoping to sell them. But a chocolate brown Rottweiler puppy with a splotch of white on his chest stole the show. I should have offered to rent him for a couple of hours since everyone who passed stopped to pet him. Hard to imagine he will one day grow into a bruiser weighing over a hundred pounds! Like most independent bookstores, the customer service is friendly and personal. It is the perfect place to browse during a lazy afternoon, perusing floor-to-ceiling shelves and tables laden with every genre of book. Then camp out on the beach or relax at an outdoor café sipping a latte or savoring a gelato.